It took 15 months, but Pattaya finally had the illegally built Bali Hai Sunset restaurant demolished for encroaching on public land. 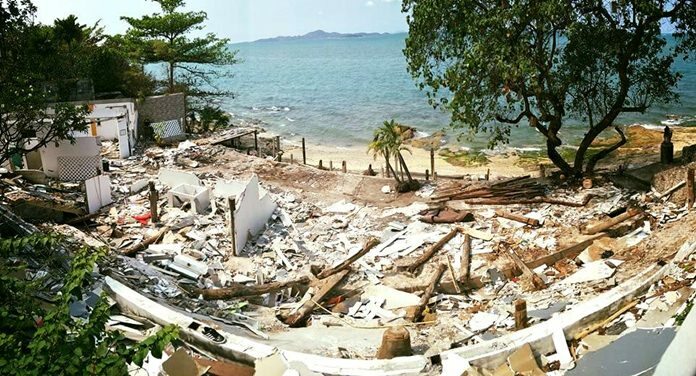 PATTAYA – It took 15 months, but Pattaya finally had the illegally built Bali Hai Sunset restaurant demolished for encroaching on public land. Region planning office technician Chris Chedsuriya and Pattaya Engineering Department public-land protection chief Thipachai Rattanaveratavorn inspected what remained of the Cozy Beach restaurant built on the shore near the Pattaya lighthouse Jan. 29. Owner Ampan Thanwan demolished the 100-sq.-meter eatery and 81-sq.-meter balcony herself rather than have the city do it and bill her. In October 2016, Ampan was given 45 days to tear down the eatery after a survey found that 80 percent of the structure was built on public beachfront. She claimed to have documents proving the property was legal, but the deeds were determined to be fraudulent. Ampan then appealed the demolition order to Chon­buri Province, which eventually threw out the case and gave her 15 days to tear down the restaurant. She met the deadline.